I initially only intended using this yamaha synth I just got with MIDI sequencer software but who am I kidding it was only a matter of time before I started looking for a keyboard to play it with. 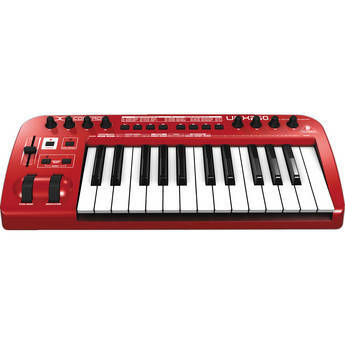 so, I'm looking for something relatively small (25 - 32 keys) for maximum portability and with a real MIDI out connection, not just USB, so I can connect it straight to my synth. so I thought I'd share my findings as they may be useful to others. so first off there's these little teeny ones which are enticing because of their sleek styling and super budget price. this thing is barely a step above playing using your qwerty keyboard. also, it's just USB, no MIDI jack. ok, this one actually has something like real keyboard keys and it has a really cool arpeggiator function. also, like most akai gear, it looks pretty cool. doesn't have a MIDI jack though. so, those are cool but I probably want something with a bit more functionality. ok, this one has USB and a MIDI out jack. Lots of other knobbies you can assign to things as well. ok, this one is a bit larger so I'm not really considering it as much but it also has both USB and MIDI out. I think it's probably one of the cooler looking ones though. this CME company is a newer chinese company that has come on the scene recently. this one also has USB and a MIDI out jack. there was another version called the U-Key as well that had some more buttons and stuff but they've either been discontinued or supply has run low and is still catching up. 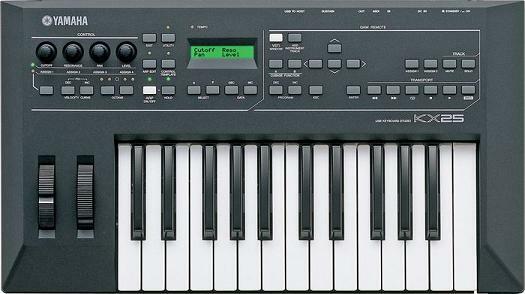 this is an awesome yamaha keyboard controller that was unfortunately discontinued. it has an insane amount of arpeggiating abilities as well being able to control drum loops on the fly. you can still find some sellers on eBay selling them new though for around $100. it has USB and MIDI in and out. you'll notice I didn't post anything about any M-Audio controllers. well, until you get up into the mid-range priced stuff, none of them have a real MIDI out jack. and I just don't like how they look. the mid range ones look pretty cool though. so if you hadn't guessed, I'm really considering the yamaha KX25. It came with some kind of special yamaha compatible version of cubase 4. I think it was discontinued because it's compatibility with other programs was a bit sketchy. I have to look into it more but if the arpeggiator and drum loop functions are all controlled on board, I don't see why compatibility would really be a problem (for what I want to use it for anyway) because it's just sending MIDI data. what kind of computer are you using it with? I love m-audio stuff, and the midi keyboard i used to have was great for the price as long as you didn't want control knobs. Theyre not too expensive, akai stuff is also awesome. Controllers are so slick these days, but the plus of having internal tones is good stuff, in my book. I will never get sick of my Access Virus KB, and would recommend any of the Access line. The Indigo came out about 10 years ago and still sounds fantastic. Polyphony is up to 32 voices, has brilliant filters and built in effects, and doesn't take up too much space. So much fun to tweak, though internal tones are more than usable on their own. I've seen them sell for around 40% of what they cost new. 50 bucks sond kool ? yeah dude, I'll take that. let me PM ya. my, that is quite a nice controller you have thar. a quick googling seems to turn up results a bit out of my range though, hah! I really like the classic styling of this Arturia controller. yeah, a lot of people seem to like them. unfortunately they don't really work for my purposes!